There is a growing perception among the smartphone enthusiast crowd that Android is an insecure mobile operating system which is riddled with viruses, trojans, rootkits and what have you, and that an Android phone will be open to these malicious pieces of software unless and until you install an antivirus. While some parts of this perception are completely wrong (we will discuss them in a separate post), we still believe that it is better to be safe than sorry and that is exactly why we’ll be talking about an supercharged new security app from avast! for Android after the jump. News of this new mobile security app comes from the folks over at Android Police – a blog dedicated to covering all things Android – in the form of a short post in which they discuss some of the features of avast!’s new app. Named avast! Mobile Security BETA, the all new app has, perhaps, the strongest feature-set we’ve ever seen for a free security app. Besides the usual automatic virus scanning, it offers a firewall (rooted phones only), GPS tracking, history wipe and web shield. Its strongest component, perhaps, is the stand-alone Anti-Theft module which is, once set up, gives you remote features like raising an alarm, locking, locating, memory wipe and restart as well as as the ability to establish specific whitelisted SIM cards (others won’t be accepted). It also protects itself using advanced techniques so it becomes impossible to remove the app unless you yourself use even more advanced removal techniques (like using ADB). 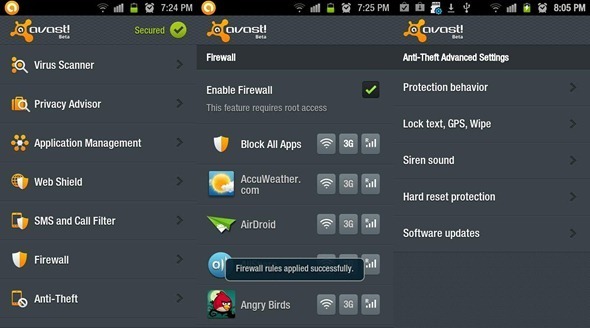 Full-featured Antivirus and Anti-Theft security for your Android phone. Protect personal data with automatic virus scans and infected-URL alerts. Stop hackers by adding a firewall (rooted phones). Control anti-theft features with remote SMS commands for: history wipe, phone lock, siren activation, GPS tracking, audio monitoring, and many other useful tools. I’ve tested the app on my rooted Samsung Galaxy S II on Android 2.3.3 Gingerbread and can confirm that it works as advertised. Besides the strange instance of Mobile Security crashing after I open Anti-Theft, I’ve had no issues with and have uninstalled Lookout Mobile Security (previous favorite) and intend to stick to avast!’s solution until something even better comes along.